Recorded sometime in 1958/’59, the album was originally released in 1959 and re-released on CD in 1999. The recordings came about when Kerouac was engaged at the Village Vanguard to read his poems and Steve Allen came to see him read one night. Allen was asked by G. Millstein, who wrote one of the first favourable reviews of On The Road in 1957 for The New York Times, whether he would accompany Jack Kerouac on the piano, which he did. Sometime after that performance, Kerouac came into the studio where Allen accompanied him reading, what was according to the liner notes, an apparently rather random selection from the poems Kerouac brought with him that day. All sections were recorded in one session. 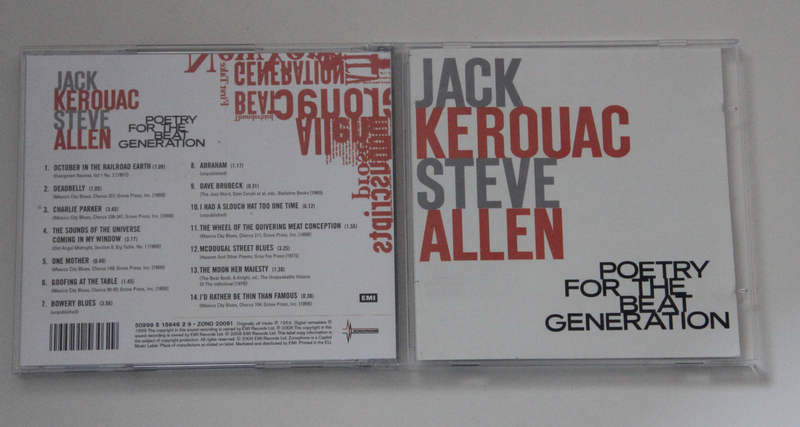 There’s not too much to be said about Steve Allen’s piano playing from my point of view, but it sounds appropriate and exactly right for the purpose of this recording, and apparently Kerouac was pleased with how it sounded. Steve Allen was of course an accomplished Jazz pianist and composer (as well as talk show host) who wrote over 14000 songs and received a Grammy for one of them. The highlight for me on here is ‘October In The Railroad Earth’. In the poem (although JK claims in ‘McDougal Blues’ (sic), that ‘I can only write prose, not poetry’) the worlds of the bum on San Francisco’s Skid Row and the commuter travelling by train back into the San Franciscan suburbs after a day’s work in the office, clash in and around 3rd and Townsend St. and ‘the little SP alley which is so much like the back alleys in (JK’s hometown) Lowell’. Mixed in are poetic passages describing him getting up to work on the railroad at 5am on a Sunday morning and the poem ends with him hanging out in a Jazz club late at night – both environments very dear to his heart. The result is a wonderful piece of musical poetry and full of atmosphere. If the title of ‘The Sounds Of the Universe Coming Through My Window’ alone wouldn’t give you the same idea, the Zen Buddhism influences in Kerouac’s work are made obvious with numerous mentions of objects such as trees, sunlight, the universe, animals, Zen, hummingbirds and ‘valleys of peaceful firewoods’. I am not exactly sure where the inspiration for ‘I Had A Slouch Hat Too One Time’ or what might be the message could be (there probably isn’t any), but it’s a fun poem and a highly entertaining story anyway. ‘Deadbelly’ and ‘Charlie Parker’ are both about Jazz musicians, one well-known (and compared to Buddha in the poem) and the other not known at all (to me at least, no idea of somebody by that name ever existed). ‘One Mother’ is apparently a love song to his mother, he’s even calling her ‘a doll’. It’s probably the most honest poem on here, as his special relationship to his mother is no secret. I also love ‘Bowery Blues’ which has got a decidedly observational character. In it he’s wandering in the area around the Cooper Union along 3rd Ave. and describing some of the scenes and people one could probably encounter there at that time – I like the poem a whole lot, a snapshot of New York at its most alluring. ‘McDougal (sic) Street Blues’ is obviously influenced by the media attention he was getting at that time and the role as a leader of ‘The Beatniks’ forced upon him and is making fun of artists with ‘no hair and black berets’ found in Greenwich Village. It ends with the line ‘I wanna be sincere’. Despite the differences in ideology these two men probably had, Steve Allen was clearly a man of the establishment, these recordings and the concept behind them work very well in my opinion. And it’s extremely fascinating to hear Kerouac’s deep and earthy voice for somebody like me who for the longest time has only read the words he wrote. ← What Happened To Kerouac? “I Had A Slouch Hat Too One Time” is a section from Kerouac’s poem “Orizaba 210 Blues” and can be found in his collection “Book of Blues”. It’s a transcription of an autobiographical monologue by William Garver, an old junkie and friend of William Burroughs, who Kerouac knew in Mexico City, mid-1950s. Garver is represented in Kerouac’s and Burroughs’ books by the name Gains (or Gaines). You can read more about William Garver on my website (see below).